It’s been about two weeks since I left my classroom at Norman High School and set up my office space at the Oklahoma State Department of Education in Oklahoma City. The transition has filled me with a variety of emotions. Most times, I find myself simultaneously excited and saddened. My colleagues know that leaving the classroom this year is the hardest thing for me to do. I mean, my work with kids is the only reason I’m here today. And while they’re well-intentioned, many of my colleagues and co-workers have said that they wouldn’t be surprised if I didn’t return to the classroom. They say this not out of malice, but with the belief that I will move on to new pastures because they envision me fighting the good fight for public education on a grander scale. Uncertain if I should be flattered, I feel torn at the very mention of a possibility that I might not return to teaching. But, in a conversation with my wife about it all, she reminded me where my roots are. During a car ride home, she said, “As much as the kids thrive from having you, you need the kids just as much.” And she’s right. I am a showman – a performer. When I’m in the classroom, every day is a performance. I stretch and warm up for my daily delivery of math to an audience that is not easily entertained. In my classroom, like so many other teachers who work with students who struggle academically, I feel like a salesman trying so hard to sell a product that I know the kids need, but they continually decline. But I am so fond of the time that I have spent building trust with my students. When they realize that my only fee for services is their time, they contribute so willingly. Then, over the course of the year, we go from crossed-arms and eye rolls to smiles and hands held high, eager to answer. If I’m being honest, that’s not always the case, but some of the wins are measured differently. Some of the wins are messy and some may not even technically be wins, but to me, if the kid is in the seat and his ears are open, that’s a win. The kids I serve could just as easily bail on my class. That would be a loss. And I’ve had those, too. Educators and administrators alike will agree with me when I say my kids and my school are my family. 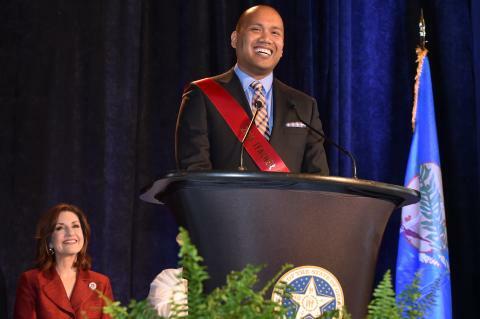 And with this wonderful year-long appointment as Oklahoma Teacher of the Year, I know that it will be hard at times. But I have found much comfort and warmth with my new family at the Oklahoma State Department of Education. Doesn’t sound very believable, though, does it? Well, not when I call them the “Oklahoma State Department of Education.” But I’m talking about the people who are here putting in work every day; many of whom made that difficult decision to leave the classroom years ago because they wanted to impact more students and teachers on a bigger scale. I can’t possibly name them all, but some of the best ones who have made me feel at home are Levi, Tiffany, Josh, Martha, Heather, Cory, Marty, Phil, Deana, Peter, Annette, Jason and Robyn to name a few. And believe me when I say that Superintendent Hofmeister is the real deal. Simple as that. I think it’s worth noting, at this point, that I am not employed by the OSDE this year. I am still a Specialized Education Math teacher being paid by Norman Public Schools and I am still in the same tax bracket. (That’s my coded way of saying: “No, friends, I didn’t get a raise.”) I say this because it’s of the utmost importance to me that my readers and followers understand that integrity is still first and foremost for me. I’m still a teacher in the trenches. Just for this year, however, I’m stepping out of the trenches to talk about what’s happening in our schools as I see it. And the way I see it, we teachers feel like we’re on a sinking ship. Well, I want to say, “Look at me. Look at me. I’m the Captain now.” I said that in my Somalian pirate accent. You’ve seen the movie Captain Phillips, right? No? Well if you haven’t, go see it. Tom Hanks is brilliant as always. Ok, I’m just trying to be funny, but stay with me on this. So there’s a sinking ship. And lots of people jumped ship. Even more are thinking about it. There are holes all over the place, the sails aren’t catching wind, and dang if it doesn’t seem like we’re under attack from unknown entities. The crew is trying to keep it together, but it seems like there’s too much going on to focus on any one thing at a time. Well, I certainly don’t have any idea how to stop this ship from sinking, but I do know that we need all hands on deck.